Brigg is a safe town. That was the message from Humberside Police Commissioner Matthew Grove when he spoke at the Town Council’s monthly meeting. He was accompanied by Superintendent Ed Cook. “I applaud you the elected members for asking me here,” said Mr Grove. He recognised Humberside Police Area had ‘bumped along’ the bottom of policing figures for too long. 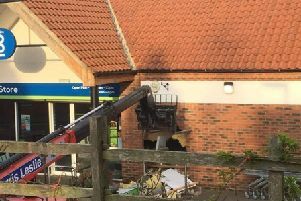 Following restructuring, councillors had been concerned Brigg Police Station now performed a different function, with its former neighbourhood team no longer based there. Mr Grove admitted initially there had been problems following the changes, but these had largely since been solved. “We have now locked police officers and PCSOs into their communities,” he said. Superintendent Cook confirmed the local police operating area was Barton, Winterton and Brigg. Mr Grove criticised the previous working arrangements, which meant the same number of officers were on shift at 7am as at 7pm when there is more crime. “We are now better able to allocate our resources. Coun Mike Campion questioned whether changes in the use of Brigg Police Station had been effective. “There are more police officers in Brigg than ever before, a lot are plain clothed but they are about,” replied Mr Grove. Coun Campion claimed a report had spoken about low morale in the local police area, to which Mr Grove replied policing was a tough job with a high profile. “We knew there were problems with our IT system but we have addressed that.